1.Absorb toxins in the tank onto the clay particles which helps improve water quality and clarity. Montmorillonite has powerful adsorption and absorption powers. Naturally, White Mineral Stone has a negative charge inside the layers of the stone, while toxins have positive ions. The negative-ion White Mineral Stone will attract positive ions of toxins and bind them. Toxins commonly found in the aquarium include Ammonia, Hydrogen Sulfide, Nitrite, Methane and other wastes. 2.Contains sufficient nutrients that encourage growth, health and higher survival rates of the shrimps. Ca (Calcium) is vital in the shell building process and helps regulate pH balance. 3.Reduce poisonous substances in the water. Improve shrimp’s health and enhance coloration. Tantora White Mineral Stones function best when it is saturated with water. Leave Tantora White Mineral Stones underwater to swell with water for 30 minutes before putting it to the tank. This will prevent cracking and breaking of the stone. 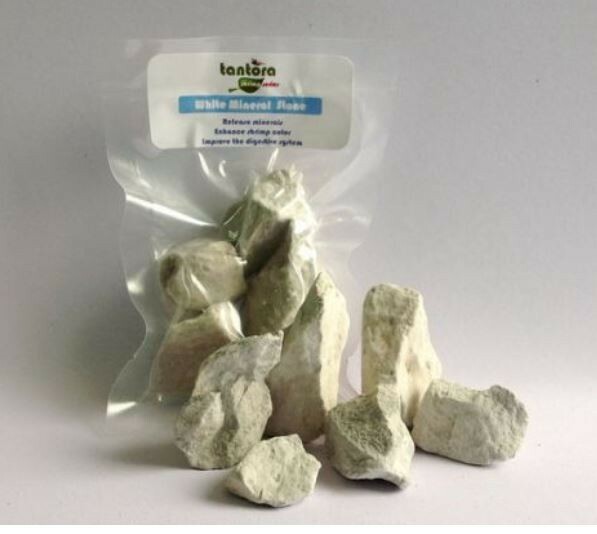 Recommend to use 100g of White Mineral Stone per 13-18G.